TUMI is recognized as a leading lifestyle brand for international business and travel. Their product quality and selection are key features that have set them apart just like the TUMI Alpha 2 Continental Carry-on. There is no other product designed and manufactured like TUMI; this is known as TUMI Difference. TUMI approaches product design by analyzing every detail and regarding each component- down to the last screw- of each item as if it were the most important. At TUMI, products are put through a set of 30 innovative and rigorous tests, many of which are entirely TUMI exclusive. Trials include: tensile strength, colorfastness to UV fading, environmental cycle, and tumble test, to name just a few. These tests are part of TUMI’s dedication to creating products with integrity. TUMI’s inspiration comes from the real world demands and struggles a traveler faces. Each and every TUMI product is taken out into the real world, for testing, touching and trying in every imaginable scenario. TUMI is focused on features that provide solutions to problems you might not even anticipate. TUMI is recognized for their technical innovation. They currently hold over 125 patents to their name! Patented fabrics like their Tegris and FXT ballistic nylon provides unparalleled durability at a super light weight. The patented TUMI Tracer program provides security by reuniting TUMI customers with their lost or stolen bag. Their ingenuity is endless! Finally, TUMI offers incredible customer service. Immediate in-store service for minor repairs, TUMI Tracer® product recovery program, and complimentary monogramming are just a few of the perks TUMI customers can expect. They have over 260 locations worldwide where customers can receive services such as zipper pull and handle repairs. No problem is too small or too big for TUMI to tackle. If you enjoy our TUMI Alpha 2 Continental Carry-on Review and want to find out more about similar products or the brand itself, we highly recommend that you visit their official website. It has an abundance of information about the various TUMI collections and array of products. On the official website, TUMI customers can create their own login to handle tasks such as tracking orders, making returns, requesting repairs, accessing their warranty or even setting their custom TUMI lock. Whether you’re looking for new arrivals in luggage, backpacks, or accessories, the official website is the best for authentic and unique TUMI products. Travelers know that the right carry-on bag will make or break travel experience. The TUMI Alpha 2 is the carry-on bag that will streamline your travel experience and make you look a like a travel pro! It’s polished look, and durable design has quickly made it one of TUMI’s most sought-after and popular styles. The TUMI Alpha 2 Continental Expandable 4 Wheel Carry-On is the height of smart design in luggage engineering, functionality and durability. Alpha 2 exemplifies Tumi’s commitment to making the best products on the market; it’s made with more than 30 design improvements and over 14 patented and trademarked Tumi components. It offers superior packing capacity with a sleek profile. Alpha 2 is constructed with Tumi’s patented fxt ballistic nylon. Jet-setters love this bag because it is large enough the carry more than a weekend’s worth, but compact enough to travel easily. It has a wonderfully sleek shape that is eye-catching in the best way. 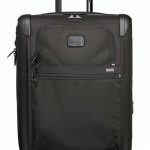 The TUMI Alpha 2 Continental Expandable 4 Wheel Carry-On comes in just one size but Tumi offers a number of different Alpha 2 bags that might help get the job done. 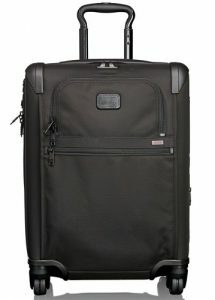 The TUMI Alpha 2 Continental Expandable 4 Wheel Carry-On is the epitome of dependable luxury luggage. We love that is designed to get around the airport easily and quickly- speed through security on 360 wheels, using a telescoping handle, and the TUMI lever lock system to allow for swift baggage check. For bonus style points, the bag can be customized with leather upgrades or monogramming! The Overall Style and Design Rating of the TUMI Alpha 2 Continental is 5 out of 5 stars! The unexpectedly high level of comfort the TUMI Alpha 2 provides is like icing on the cake for this unique handbag. One might imagine that such a tough and durable carry-on that can hold all your essentials would feel bulky and uncomfortable. But on the contrary, the TUMI Alpha 2 offers a different experience thanks to some very thoughtful design elements from a team of genius designers who are clearly designing for the on-the-go, jet-setting traveler. Smartly designed with FXT ballistic nylon, the bag feels incredibly light. It’s just what you want when you’re stashing all your carry-on items for your next trip! When you’re in the airport, you don’t want to be weighed down by your luggage. With the TUMI Alpha 2 you can feel comfortable and supremely stylish at the same time! The TUMI Alpha 2 is designed to be carried by rolling. Any frequent traveler can appreciate the ease with which one can navigate the airport with a smartly designed rolling carry-on. 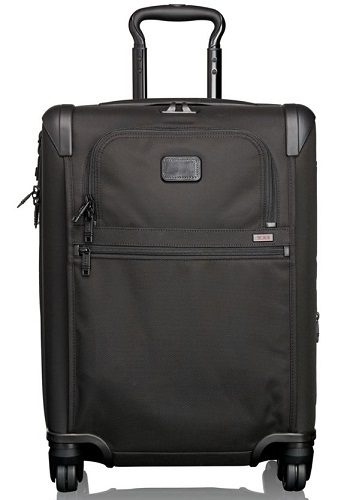 Built to be fully maneuverable, the TUMI Alpha 2 has 360 swivel wheels. The bag features a three stage telescoping handle, so you can adjust it to feel just right for your height. The TUMI Alpha 2 is designed to have a lower center of gravity and for stable and comfortable navigation. Now getting your luggage through the airport doesn’t have to be an exhausting or laborious experience! Every detail of this carry-on bag is well designed to be light, modern and multi-functional. The Overall Rating for Comfort of the TUMI Alpha 2 is 5 out of 5 stars! You will immediately notice how polished and well-crafted the TUMI Alpha 2 feels the moment you carry it. This remarkable carry-on bag is made up of several different high-quality materials to make it last for years worth of jet-setter travel. The body of the bag is made of a premium quality, FXT ballistic nylon material. 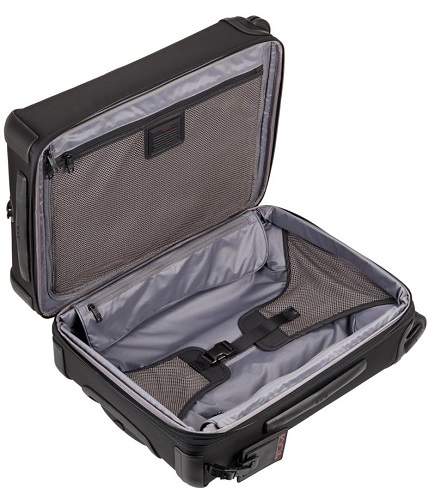 TUMI developed and patented, this material is ultra-durable, having passed TUMI’s extensive testing. Many see it as a must-have for frequent travel. It has a professional polished look, and best of all it is easy to clean! It is resistant to water, sweat, UV fading and abrasions. The TUMI Alpha 2 has other major advantages in durability – their patented Durafold™ Construction design reinforces the case frames for high-quality strength and longevity. In addition, impact-resistant caps improve corner durability. The bag comes with a TUMI tested, virtually indestructable X-Brace 45® handle system. Armed with these features, you can feel confident about traveling anywhere and your luggage staying completely intact and secure. Speaking of secure, consider adding a cheap Trakdot luggage tracker to your luggage considering the Tumi Alpha 2 line isn’t cheap. An interesting point of contestation is the fact that Tumi does not offer a lifetime warranty for their expensive products. Now some people will dismiss this bag purely on this fact but they do offer a 5 year warranty for those who are still open to purchasing a Tumi product. On top of that the first year of warranty, Tumi will repair or replace your luggage if it’s damaged due to a number of incidents, including normal wear and tear, airline handling and other transit damage. For travel-savvy shoppers who strive to find impeccable design and top-notch durability in a carry-on, the TUMI Alpha 2 is the ultimate! Along with it’s professional and timeless look, you will get a long-lasting carry-on you can count on. Incredibly damage resistant, the TUMI Alpha 2 will stay with you for years easy and convenient travel. The Overall Rating for Durability of the TUMI Alpha 2 is 5 out of 5 stars! We have already covered several of the key features in this TUMI Alpha 2 review, but going over the entire list will be beneficial to those of you seeking certain specifications. Every traveler has a certain qualities that they desire in a carry-on bag- we bet the TUMI Alpha 2 will exceed your expectations! The Overall Rating for Features of the TUMI Alpha 2 is 5 out of 5 stars! TUMI goes above and beyond expectations in features of durability and design, surprising even the most picky and demanding traveler. Unique features such as handles made from aircraft-grade aluminum and FXT ballistic nylon, make for a lightweight and virtually indestructible bag that is a spectacular buy. 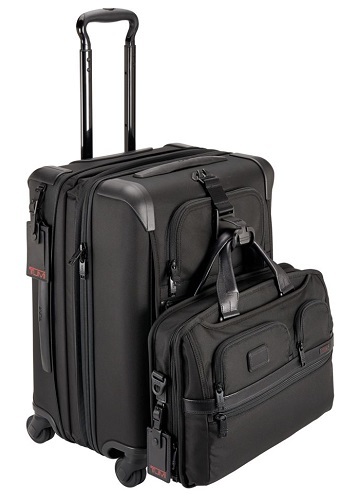 The TUMI Alpha 2 Continental Expandable 4 Wheel Carry-On is one of TUMI’s best sellers. 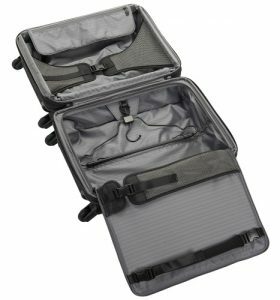 It has been a favorite product in their Alpha 2 collection, and it’s clear why – the combination of sleek, professional looking design and unparalleled durability in a carry-on such as this one are truly hard to come by. The price is steep, but for the impressive quality of the product, it could be worth it. You are making an investment in an innovative piece of luggage that will be all you’ll need for years of travel. The TUMI materials are one-of-a-kind and high quality. You’re also paying for the brand and the warranty and amenities that go with it. For serious travelers who are looking to invest a top-of-the-line, long lasting bag, this could be for you. Durability – You’ll be hard pressed to find a bag more durable than a TUMI bag. Put through 30 rigorous product-quality tests, and designed with patented, one-of-a-kind materials, the TUMI Alpha 2 is destined to withstand even the most demanding travel conditions. Enjoy it for years! Convenience – The design features of the TUMI Alpha 2 are made for real world travel. We love the convenience of the 360 recessed wheels, the easy-to-use lever lock system, and size and fit that will store easily on the plane. Customer Service – With your TUMI purchase, you will receive amazing customer service and support. Customers will receive a great warranty on their bag, free returns, and more. Whether you want to chat live online, email, call, or come into a TUMI store, you’ll be pleased with TUMI’s customer support. Price – The price is steep, and although the upgrade is well worth the investment, we recognize that it may not be accessible for all shoppers. What can we say? This carry-on leaves nothing to be desired! The only downfall is that it may fall outside of the price-range of some potential buyers. 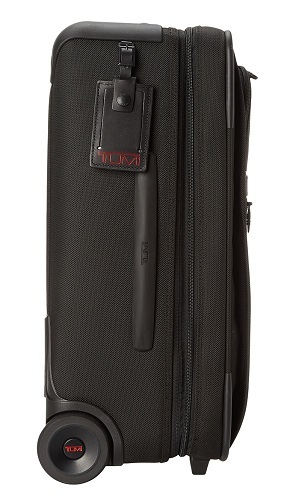 The TUMI Alpha 2 Continental Carry-on is a top-of-the-line, designer carry-on luggage bag. This style is a TUMI top-seller because of its durable materials and fresh, modern design. Now shoppers don’t have to choose between function and luxury when packing a carry-on bag for travel. With the TUMI Alpha 2, you can have it all! If you are looking for a long-lasting, reliable carry-on from a designer you can trust, this bag is for you. designed to provide a means for us to earn fees by linking to Amazon.com and affiliated sites.